Hark is a timid, pacifistic Viking with a love for all living things inspired by watching PETA documentaries. Crone is a vintage Schwinn road bike and a bit of an outcast himself, but it's not his fault who his rider is. Something has to change before the Elder bicycle and Orr, the Viking leader, throw them both out with the spare parts. A century after Fukushima and the toxic sea, Harek and his mind-beaming bicycle must prove themselves in a world where everyone (and every thing) is out to get them. Including Alec Baldwin. A hilarious audio book not to be missed! What made the experience of listening to The Bikings the most enjoyable? Which character – as performed by David Radtke – was your favorite? Bikings is an odd-ball tale of multiple absurdities that kept me chuckling from start to finish. More than just being a strange story, it's a well-written tale that keeps the reader engaged. 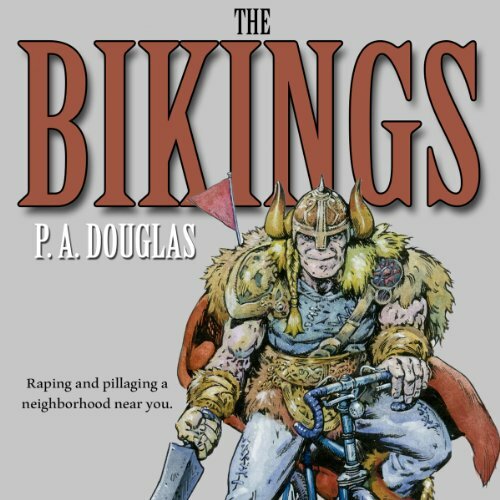 The idea of vikings on bikes in the post apocalypse is fun and never once failed to make me smile. And I can't get enough of the flesh-eating babies. Here's hoping they get their own sequel. The title of my review says it all. It's bizarre, but in a very good way. Just when I thought it couldn't go any further, it actually did. Very well written and read. This is one of Mr. Douglas' best works. I don't want to say anymore. I'll just let you experience it for yourself. Part How to train you dragon, part Heavy Metal, part Akira, "Bikings" is a raucous romp through a post apocalyptic world where psychic bicycles, cybernetic celebrities, and hordes of flesh eating babies are commonplace. The book is expertly narrated by David Radtke, whose natural voice lends itself perfectly to the title's protagonist. David also provides numerous distinct and memorable character voices to add to the fun. Not for the faint of heart or family oriented due to the graphic imagery and coarse language, this book is still loads of fun to listen to during a long commute.